Drawing of an owl-shaped clay Ding -- a masterpiece sculpture that captures the incredibly alertness of the nocturnal creature. This piece belongs to the 仰韶文化Yangshao Culture (–5000 => –3000) of the Neolithic Period. 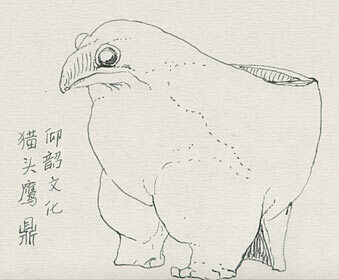 A 鼎Ding is a vessel with three legs, a tripod; here, the tripod is formed ingeniously by the bird's two legs and tail. It was largely used for ceremonies, but later alchemist would use the Ding for scientific experiments. * All my drawings here are made after original objects. Earliest Homo erectus discovered in China Drawing of two incisors belonging to the 元谋猿人Yuanmou Man who lived 1.7 million years ago during the Lower Paleolithic Period. The upper and medial incisors were unearthed at Shangnabang village, Yuanmou County, Yunnan Province, in 1965. In the north, the representative sample is from the 周口店Zhoukoudian location in Beijing. In the south, samples of the same period came from the 观音Guanyin cave in 贵州黔西Qianxi, Guizhou Province. Flourished on the Middle Valley of the 长江Changjiang (Yangzi River), in the area around the flat plains of today's 河南省澧县澧阳Li county, Henan Province. This is the earliest culture along the Yangzi River valleys. The Peiligang culture flourished on the middle valley of the 黄河Huang He (Yellow River). Although the animal was shaped very abstractly, it is clearly a lively pig. The pig belongs to the Neolithic 河姆渡文化Hemudu culture (about –5000 => –4500). The artifact measures 6.7 cm long, unearthed at Hemudu, Yuyao, Zhejiang Province. A flask for holding water, symmetrically balanced and decorated. Neolithic 仰韶文化Yangshao culture, about 6,000 years ago. A pregnant woman, beautifully and realistically modelled in clay. 红山文化Hongshan culture (about –4700 => –2900). A smiling dragon carved in jade. 红山文化Hongshan culture (about –4700 => –2900). An elegant clay Gui (jug) for holding water or wine. Neolithic 大汶口文化Dawenkou culture (about –4300 => –2500). This cultured flourished on the 黄河下游Yellow River Lower Valley. A extraordinary small clay 鼎Ding for cooking. The legs appear to be inspired by fish fins. 良渚文化Liangzhu culture (about –3300 => –2200). An early needle made of bone. The eye is clearly defined. Karuo culture (about –3300 => –2100).